Following the continued detention of Biafra Radio Director, Mr. Nnamdi Kanu by the Department of State Security, DSS, a renowned cleric, Prophet Anthony Nwoko of the Church of God, weekend called on President Muhammadu Buhari to ensure Kanu’s immediate release or Heaven will fall. “I cannot find any clean political leader from the South East. The governors are selfish, self centered, and have never pursued any action that will uplift the overall well-being of Igbo nation.“Buhari must release Nnamdi Kanu with immediate effect, otherwise the heavens will strike,” he said. “step forward now and fulfil God’s mandate for the Igbo nation.“The religious leaders saw the glory in the country but could not deliver the message to the nation, the judgment will be upon them for denying Christ, his glory. I was spiritually crowned for the nation and the world and was sent on a special mission for the glory of God.“They should allow this light to materialize, if not crisis will overrun the nation as a whole, Prophet Nwoko is a chosen prophet, Igbos should seek for the prophet. The truth is finally here, but Nigeria finds it difficult to believe, the nation refuses to recognize the presence of the anointed saviour of the world because of tribalism,” he insisted. On the way forward for the nation, the Cleric said that the earlier the country returned to God the better. This man doesn’t know what he is saying, if ever since democracy has been lunch in this country, and there are no trustworthy governor since then, that means u yourself can’t be trust. You don’t know when and what it’s cost a country to split. It’s will definatly split blood, it has happen before all in the name of this same Biafra, can u remember the outcome? Or how many people lost their life? Man up prophet, start praying for the nation not threatening the nation, ok? U CRIMINALS,,,, *******,,, GOATS THAT HAVE DESTROYED THE NAME OF NIGERIA NOW YOU PEOPLE WANT TO FORM YOUR “CRIMINAL REPUBLIC(BIAFRA)” MADNESS. D igbo pple are angry about dis delay nd arresting of a freedom fighter dat wnts gud for his pple,, am even not comfortable me nd a yoruba or hausa man answering brothers in d name of One Nigeria…..For Godsake,, I don’t wnt to be ur brother nd I don’t wnt to share d same country wit u,, Be on ur own,, Hustle on ur own as a man,, make progress on ur own let me do same on my own,, instead u keep crawling to us as if u yoruba’s and hausa’s can’t live without us…….May God help u zoological republic……I want to Tell u guys one tin,, D truth is Yoruba and hausa afraid of dia failures nd dey can’t live without d Igbo’s..Una ***,, We mst Go by fire by force…. Witout d Igbo’s…..Yoruba nd Hausa’s can’t live,, all dey do is depending on us,, but I tell u 2day dose days are over…..Support the split if u really think u a yoruba man can survive in dis world Witout d Igbo’s bastards……Dat Fulani boko haram man u call ur president shuld Jst do himsef a favour by releasing Nnamdi Kalu,, or else…….Make I no talk……But if u yoruba’s say igbo nation shuld hve dia independence as Biafran’s Lolz,, I go Jst catch one yoruba man here I dey live do am every every……Una ******……. This is a sectional and tribal prophet who wants evil for the Nation in the name of beloved biafra. Let him go into politics to save his people. A chop and chop prophet threatening heaven if a treasonable culprit is not released. He has been granted bail afterall, the prophet should help him fulfill the bail condition if he so loves the fake biafran leader. Pray for the nation and stop the harrassment. look at this fool! na PMB arrest am? even JESUS wey the JEWS killed,heaven dey camkpe,talkless of dis son of thousands fathers. mr.pastor comot dat ur smellin mouth mek we fil d world ventilation. 19 pastors and general overseers wey prophecise d downfall of PMB for d general election do thier lies succeed!?. Prophet Kwoko claimed that Nigerian people don’t recognized him as prophet because of his Igbo tribe. That is tribalism in public display. In addition to that, he issued a threat to our government for not releasing a potential terrorist that heaven will strike Nigerian nation. What a great Prophet indeed! I have no idea which heaven the prophet is referring to, but if it that Heavens that God Almighty who had already manifested himself through His only begotten son-Jesus Christ dwells, then PMB admistration, the DSS and other National Security agencies are fine and have nothing to worry about for doing their job of stopping potential terrorist and restoring peace and order in the land. However, the prophet was right with the notion that the Southeast governors except few have very selfish for abandoning their youths. Mr. Kanu Nnamdi is a potential terrorist that should be detain in Maximum prison for publicy advocating for civil war, civil unrest and promoting hatred and tribalism to distabilize our nation. The Heavens that Jehovah dwells will not falls because the government is doing her job just as any government in her situation will do anywhere in the world to protect her citizens against trouble makers or terrorist. Mr. Kanu Nnamdi should remain in the prison of the zoo called Nigeria until the SSS and DSS determine it is okay to free that 419, uncultured and mannerless foreigner from London. Col. Ojukwu who abandoned Biafra after the defeat for Nigerian unity more than 45 years ago never begged for money, Kanu has embezzled millions of naira from dumb Igbos to live a decent lifestyle. There is God ooooooooooooo! IGBOS are u nt d lostship tribe of d house of israel? u wil remain SUYA NAMA in d eyes of d HAUSAS. tel KALU to go and ask OJUKU’S family. UBAKASON u’re still a kid u dnt know wat WAR means,u nva experience eradicating a whole family wit out remainder. IGBOS,pesin wey get liver no dey talk coz action is louder dan voice. @ omooshikehinde you think that ur one of the smartest guy in social media whenever the biafra issue arise, who give you the **** justification to brand nnmadi kanu a 419 and a foreigner from london ur just an idiot wit empty brain who lacks fedralcharcter, in one of your ****d post ur calling igbo people all sort of names forgeting that the world yahoo boys origenated from yoruba guys. ur **** tribe have stain nigeria name in international community than the igbos, go asia ur brothers have started yahoo plus using charm to obtain byforce still your *****blame the igbos. what about ur yoruba brothers in cuba , brasil, argentina bolivia pls can you+*- kindly tell me what their doing there. if the people from south east want their own repulic the only solution is to call for referendum. stop abusing igbos with all sorts of malicious lies because we are hard working people unlike ur **** tribe that is ******* infact hausa peolpe is better than you guys atleast their good in farming while igbo people is good in trading, what are yorubas people good for a*****parties, and please don;t tell me about academics because we all knw ******* and their fake proffesorship ************. Hello chief dd, personally, I don’t like to response to********** but I felt compel to response to your writeup. I want to believe that you are one of those ***** Igbos who think that their messiah has come in form of that 419 called Kanu Nnamdi. It is a pity that even after 50 years since the end of the civil war that claimed precious lives of millions of Igbos, some **** Igbos haven’t learned their lessons. It is good to remind short minded people like you that non of Ojukwu’s immediate father members dead during Biafran war in the 60s. Why? Col. Ojukwu and all his families were smart enough to leave Nigeria as soon as the war got ugly and intensified. In addition to that, the smart and sharp guy-Kanu Nnamdi is a British citizen in case you don’t know. When he cajole his victims and have realized enough money to live a decent lifestyle, the guy will quickly relocate back to British while he lives his dumb followers to kill themselves, distabilize the social and economic activities and development of Southeast region, and cause civil unrest. By then, Kanu would have been in London cooling off with your money. Ojukwu did the same thing during the last civil war with all his families, he was cooling off, and commanding operations of Biafra agitators from a mansion in a foreign country while thousands of your people are dying daily in the war front created by Ojukwu. Col. Ojukwu was far better to lead the course of Igbos then. Why? He was born into wealth, highly educated, and a career man who rose to the position of Colonel in Nigerian army. But Kanu never had any serious job in Nigeria or London. He prey on dumb and jobless Igbo people living in Southeast to make a living. The ***** among you still want another war that will be led this time around by a British citizen. It is high time for the Igbo youths to denounce this craziness, intolerance and tribalism in the name of Biafra. No one is holding the Igbos from succession away from Naija, but they have to do what Ojukwu did before the declaration of the civil war. And that, all Igbos must first leaves the southwest, north, and southsouth regions and relocate to those five typical Igbo states. The second thing is to start developing your economy and infrastructures. Those millions of Igbos doing well outside home should denounce Kanu and other **** followers of his like Chief dd. The Ndigbo people will benefit nothing from this Biafran agitation rather than breed more kidnappers, robbers, and crooks that will destroy social and economic activities of their land. The intolerance of the northern elite during Obasanjo admustration breed Boko Haram terriorist. The Ogbos are tending toward that direction just becsuse PMB is a northerner. Finally, the Igbos should address their own problems at home, call their political leaders to order, and stop blaming the Yorubas and Hausa / Fulani for their own problems. How can people whose over 70% of their people live outside Southeast claimed to be agitating for Biafra state? To me, that sounds dumb, unreasonable, and unrealistic. 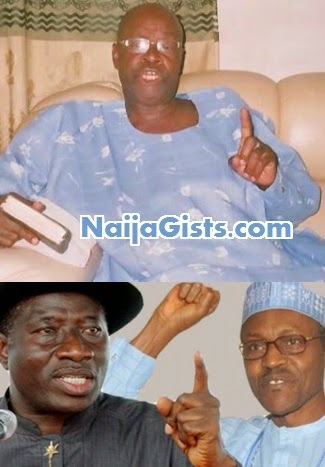 Was not jonathan president for six years? Why didnt the biafrans agitate then? Brother, if you’re wise u’ll keep quite cause you dont know the price to pay for war and even if you do, i dont think you can pay.